CALL FOR REVIEWERS: The Whirligig of Time: | Book Hub, Inc.
Here’s how it works. If you’re already on our reviewers list then you automatically receive a free eBook with the understanding that Book Hub Inc will receive your honest and lively review for the listing below. If you’re not on the reviewer list and want to review for this listing, then tell us something about yourself. Help Nora, she is almost 100 years old by purchasing at one of her three eBooks at the retail sites listed below. 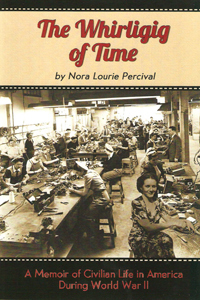 Nora Percival’s third memoir completes a trilogy about a woman’s life during three significant spans of her long lifetime. It recaptures the arduous days of World War II, when civilians in America were focused on defending our way of life against the brutal tyranny of Nazism. As she delineates her role in the national emergency, the sympathetic reader follows her vicissitudes and the drastic dislocations suffered by so many women in wartime. Woven into her chapters, these reports provide a vivid portrait of the trials and triumphs of women’s private battles. It was her concern for the unhappily divided state of our present world that impelled Percival to write of a time when Americans were united, all working together to save our country from Hitler’s despotic assault. Biography: Nora Lourie Percival was born just after World War I in Samara on the Volga River in Russia. The revolution drove her father out of the country to safety, and her family lived through a civil war and a famine. These tribulations were recorded in “Weather of the Heart,” her first memoir. In 1922, the family was reunited in New York, where Nora grew up. The author’s career has been largely in the editorial field. She has worked for Random House, the American Management Association, and Barnard College. Now long retired, she is still writing and working as a freelance editor. An only child, she has raised five children and now has eleven grandchildren. She lives in the mountains of North Carolina, where she enjoys the natural beauty and is inspired by the literary renaissance in the South. Cornioley, Pearl Witherington. Code Name Pauline: Memoirs of a World War II Special Agent (Women of Action). This entry was posted in Uncategorized and tagged 100 YEARS OLD, amazing, great story, history, memoir, North Carolina, Russia, strong woman, trilogy, US immigrant, women, women's story. Bookmark the permalink.